The Mark 5 is large, heavy and awkward. I needed a dedicated worktable and an easy way to store and retrieve it. I needed a cart with wheels. Although this page isn't exactly about coilguns, I'm including here simply as documentation about the project. And I hope you read about Freecycle and, if possible, begin using it. www.freecycle.org is a grassroots movement to keep good stuff out of landfills. It's a free and easy way to give and get things in your own town. To join, find your community, subscribe for free and watch the messages for interesting stuff! Freecycle has more than 4,000 local groups and over 7,000,000 members. Many of these are based on Yahoo! Groups technology. I'm a member of Freecycle East King Count WA. On October 8th 2010, a local group offered a large storage cart. This was once a Boy Scout project built almost from scratch. I was fortunate to win the giveaway and picked it up the same day less than five miles from home. 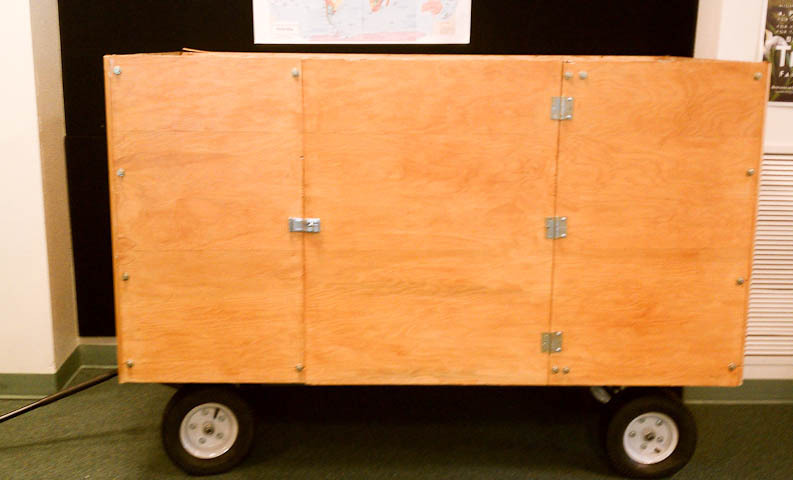 The original cart was a wooden bin 4-feet wide, 3-feet high and 6-feet long mounted on inflated tires with a handle and steerable wheels. With four plywood walls (no top) it was very heavy and larger than I needed. Fortunately, the entire assembly was easy to redesign with a wrench and hand saw. The wood panels could be cut down to a new size and be bolted on again. My goal was to have a rollable workbench, with the ability to stack two boxes under it. So it is designed to be 2-feet wide and 6-feet long, i.e. the same width as the metal frame base. It is now 2-feet high to accomodate two stacked boxes. Here are my construction photos and the final product. There were a lot of parts and wooden remnants left over. This saved a substantial amount of weight, making it more stable than the original cart. As a bonus I collected five pounds of bolts, hinges and other hardware for my parts box. This cart can be very effectively be used as a coilgun workbench and cost me nothing in parts and materials. However, it is still a bit too heavy for these small inflatable tires. The capacitor bank on top makes it top-heavy and the cart wobbles seriously on corners and uneven surfaces. The workbench height is slightly higher than is comfortable. It was a great little project but I will probably have to cut it down further.